This section provides a walkthrough of a series of example Dataflow pipelines that demonstrate more complex functionality than the basic WordCount example. The pipelines in this section process data from a hypothetical game that users play on their mobile phones. The pipelines demonstrate processing at increasing levels of complexity; the first pipeline, for example, shows how to run a batch analysis job to obtain relatively simple score data, while the later pipelines use Dataflow's windowing and triggers features to provide low-latency data analysis and more complex intelligence about user's play patterns. Note: These examples assume some familiarity with the Dataflow programming model. If you haven't already, we recommend familiarizing yourself with the programming model documentation and running a basic example pipeline before continuing. Note also that the example pipelines use the Java 8 lambda syntax, and thus require Java 8. However, you can create pipelines with equivalent functionality using Java 7. For further information, you can check out the Dataflow & Spark blog post, which uses the examples in this domain to illustrate how how the Dataflow programming model compares to that of Apache Spark. A timestamp that records when the particular instance of play happened--this is the event time for each game data event. When the user completes an instance of the game, their phone sends the data event to a game server, where the data is logged and stored in a file. Generally the data is sent to the game server immediately upon completion. However, users can play the game "offline", when their phones are out of contact with the server (such as on an airplane, or outside network coverage area). When the user's phone comes back into contact with the game server, the phone will send all accumulated game data. This means that some data events might be received by the game server significantly later than users generate them. This time difference can have processing implications for pipelines that make calculations that consider when each score was generated. Such pipelines might track scores generated during each hour of a day, for example, or they calculate the length of time that users are continuously playing the game—both of which depend on each data record's event time. Because some of our example pipelines use data files (like logs from the game server) as input, the event timestamp for each game might be embedded in the data--that is, it's a field in each data record. Those pipelines need to parse the event timestamp from each data record after reading it from the input file. For pipelines that read unbounded game data from a streaming source (such as Google Cloud Pub/Sub), the data source sets the intrinsic timestamp for each PCollection element to the appropriate event time. The Mobile Game example pipelines vary in complexity, from simple batch analysis to more complex pipelines that can perform real-time analysis and abuse detection. This section walks you through each example and demonstrates how to use Dataflow features like windowing and triggers to expand your pipeline's capabilites. The UserScore pipeline is the simplest example for processing mobile game data. UserScore determines the total score per user over a finite data set (for example, one day's worth of scores stored on the game server). Pipelines like UserScore are best run periodically after all relevant data has been gathered. For example, UserScore could run as a nightly job over data gathered during that day. Note: See UserScore on GitHub (master-1.x branch) for the complete example pipeline program. Please also ensure that you've followed the instructions in the Getting Started guide before attempting to run any of the examples. In a day's worth of scoring data, each user ID may have multiple records (if the user plays more than one instance of the game during the analysis window), each with their own score value and timestamp. If we want to determine the total score over all the instances a user plays during the day, our pipeline will need to group all the records together per individual user. UserScore parses out only the data that it needs from each record, specifically the user ID and the score value. The pipeline doesn't consider the event time for any record; it simply processes all data present in the input files that you specify when you run the pipeline. Note: To use the UserScore pipeline effectively, you'd need to ensure that you supply input data that has already been grouped by the desired event time period—that is, that you specify an input file that only contains data from the day you care about. Read the day's score data from a file stored in Google Cloud Storage. Write the result data to a BigQuery table. Figure 1: Score data for three users. This example uses batch processing, and the diagram's Y axis represents processing time: the pipeline processes events lower on the Y-axis first, and events higher up the axis later. The diagram's X axis represents the event time for each game event, as denoted by that event's timestamp. 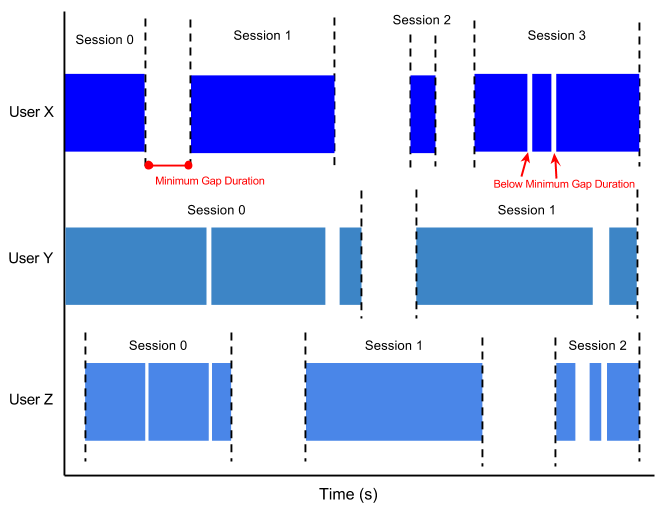 Note that the individual events in the diagram are not processed by the pipeline in the same order as they occurred (according to their timestamps). UserScore writes the data to a BigQuery table (called user_score by default). With the data in the BigQuery table, we might perform a further interactive analysis, such as querying for a list of the N top-scoring users for a given day. UserScore also only reports the total results for the entire day, and doesn't provide any finer-grained information about how the data accumulated during the day. Starting with the next pipeline example, we'll discuss how you can use Dataflow's features to address these limitations. The HourlyTeamScore pipeline expands on the basic batch analysis principles used in the UserScore pipeline and improves upon some of its limitations. HourlyTeamScore performs finer-grained analysis, both by using additional features in the Dataflow SDKs, and taking into account more aspects of the game data. For example, HourlyTeamScore can filter out data that isn't part of the relevant analysis period. HourlyTeamScore calculates the total score per team, per hour, in a fixed data set (such as one day's worth of data). HourlyTeamScore filters data events based on whether their event time (as indicated by the embedded timestamp) falls within the relevant analysis period. Basically, the pipeline checks each game event's timestamp and ensures that it falls within the range we want to analyze (in this case the day in question). Data events from previous days are discarded and not included in the score totals. This makes HourlyTeamScore more robust and less prone to erroneous result data than UserScore. It also allows the pipeline to account for late-arriving data that has a timestamp within the relevant analysis period. Figure 2: Score data for two teams. Each team's scores are divided into logical windows based on when those scores occurred in event time. Note: As is shown in the diagram above, using windowing produces an independent total for every interval (in this case, each hour). HourlyTeamScore doesn't provide a running total for the entire data set at each hour--it provides the total score for all the events that occurred only within that hour. Dataflow's windowing feature uses the intrinsic timestamp information attached to each element of a PCollection. Because we want our pipeline to window based on event time, we must first extract the timestamp that's embedded in each data record apply it to the corresponding element in the PCollection of score data. Then, the pipeline can apply the windowing function to divide the PCollection into logical windows. Notice that the transforms the pipeline uses to specify the windowing are distinct from the actual data processing transforms (such as ExtractAndSumScores). This functionality provides you some flexibility in designing your Dataflow pipeline, in that you can run existing transforms over datasets with different windowing characteristics. HourlyTeamScore uses filtering to remove any events from our dataset whose timestamps don't fall within the relevant analysis period (i.e. they weren't generated during the day that we're interested in). This keeps the pipeline from erroneously including any data that was, for example, generated offline during the previous day but sent to the game server during the current day. // that fall after the time period we want to analyze. One way we can help address the latency issue present in the UserScore and HourlyTeamScore pipelines is by reading the score data from a streaming source. The LeaderBoard pipeline introduces streaming processing by reading the game score data from Google Cloud Pub/Sub, rather than from a file on the game server. Note: For the LeaderBoard pipeline to use Pub/Sub as an input source, the game server would need to actively publish the score data to Pub/Sub as it arrives, rather than simply logging it and writing it to a file. Because the LeaderBoard pipeline reads the game data from a streaming source as that data is generated, you can think of the pipeline as an ongoing job running concurrently with the game process. LeaderBoard can thus provide low-latency insights into how users are playing the game at any given moment—useful if, for example, we want to provide a live web-based scoreboard so that users can track their progress against other users as they play. LeaderBoard calculates the total score for every unique user and publishes speculative results for every ten minutes of processing time. That is, every ten minutes, the pipeline outputs the total score per user that the pipeline has processed to date. This calculation provides a running "leader board" in close to real time, regardless of when the actual game events were generated. In addition, the team score calculation uses Dataflow's trigger mechanisms to provide speculative results for each hour (which update every five minutes until the hour is up), and to also capture any late data and add it to the specific hour-long window to which it belongs. Below, we'll look at both of these tasks in detail. We want our pipeline to output a running total score for each user for every ten minutes that the pipeline runs. This calculation doesn't consider when the actual score was generated by the user's play instance; it simply outputs the sum of all the scores for that user that have arrived in the pipeline to date. Late data gets included in the calculation whenever it happens to arrive in the pipeline as it's running. Figure 3: Score data for for three users. Each user's scores are grouped together in a single global window, with a trigger that generates a snapshot for output every ten minutes. * Extract user/score pairs from the event stream using processing time, via global windowing. * Get periodic updates on all users' running scores. Note that LeaderBoard uses an accumulating trigger for the user score calculation (by invoking .accumulatingFiredPanes when setting the trigger). Using an accumulating trigger causes the pipeline to accumulate the previously emitted data together with any new data that's arrived since the last trigger fire. This ensures that LeaderBoard a running sum for the user scores, rather than a collection of individual sums. We want our pipeline to also output the total score for each team during each hour of play. Unlike the user score calculation, for team scores, we care about when in event time each score actually occurred, because we want to consider each hour of play individually. We also want to provide speculative updates as each individual hour progresses, and to allow any instances of late data—data that arrives after a given hour's data is considered complete—to be included in our calculation. Because we consider each hour individually, we can apply fixed-time windowing to our input data, just like in HourlyTeamScore. To provide the speculative updates and updates on late data, we'll specify additional trigger parameters. The trigger will cause each window to calculate and emit results at an interval we specify (in this case, every five minutes), and also to keep triggering after the window is considered "complete" to account for late data. Just like the user score calculation, we'll set the trigger to accumulating mode to ensure that we get a running sum for each hour-long window. Note: Since LeaderBoard reads its input data from Pub/Sub, the PubsubIO adapter automatically sets the intrinsic timestamp on each element to the appropriate event time. We don't have to manually extract the timestamp from the data itself; the timestamp is derived from a Pub/Sub data element attribute. The triggers for speculative updates and late data help with the problem of time skew. Events in the pipeline aren't necessarily processed in the order in which they actually occurred according to their timestamps; they may arrive in the pipeline out of order, or late (in our case, because they were generated while the user's phone was out of contact with a network). Dataflow needs a way to determine when it can reasonably assume that it has "all" of the data in a given window: this is called the watermark. In an ideal world, all data would be processed immediately when it occurs, so the processing time would be equal to (or at least have a linear relationship to) the event time. However, because distributed systems contain some inherent inaccuracy (like our late-reporting phones), Dataflow often uses a heuristic watermark. Figure 4: Score data by team, windowed by event time. A trigger based on processing time causes the window to emit speculative early results and include late results. The dotted line in the diagram is the "ideal" watermark: Dataflow's notion of when all data in a given window can reasonably considered to have arrived. The irregular solid line represents the actual watermark, as determined by the data source (in our case, Pub/Sub). Data arriving above the solid watermark line is late data—this is a score event that was delayed (perhaps generated offline) and arrived after the window to which it belongs had closed. Our pipeline's late-firing trigger ensures that this late data is still included in the sum. While LeaderBoard demonstrates how to use basic windowing and triggers to perform low-latency and flexible data analysis, we can use more advanced windowing techniques to perform more comprehensive analysis. This might include some calculations designed to detect system abuse (like spam) or to gain insight into user behavior. The GameStats pipeline builds on the low-latency functionality in LeaderBoard to demonstrate how you can use Dataflow to perform this kind of advanced analysis. Like LeaderBoard, GameStats reads data from a streaming source, in this case Pub/Sub. It is best thought of as an ongoing job that provides insight into the game as users play. Below, we'll look at these features in more detail. Let's suppose scoring in our game depends on the speed at which a user can "click" on their phone. GameStats's abuse detection analyzes each user's score data to detect if a user has an abnormally high "click rate" and thus an abnormally high score. This might indicate that the game is being played by a bot that operates significantly faster than a human could play. To determine whether or not a score is "abnormally" high, GameStats calculates the average of every score in that fixed-time window, and then checks each score individual score against the average score multiplied by an arbitrary weight factor (in our case, 2.5). Thus, any score more than 2.5 times the average is deemed to be the product of spam. The GameStats pipeline tracks a list of "spam" users and filters those users out of the team score calculations for the team leader board. We can gain some insight on when users are playing our game, and for how long, by examining the event times for each game score and grouping scores with similar event times into sessions. GameStats uses Dataflow's built-in session windowing function to group user scores into sessions based on the time they occurred. Figure 5: User sessions, with a minimum gap duration. Note how each user has different sessions, according to how many instances they play and how long their breaks between instances are. You can find out more about how these examples work by running the example pipelines, which are included in the Dataflow SDK Examples (master-1.x branch) on GitHub. See the README.md in the examples directory for full instructions on running the included example pipelines. Dataflow & Spark blog post — a blog post authored by Google engineers that uses examples in the mobile gaming domain to illustrate how the Dataflow model compares to that of Apache Spark. Dataflow talk @Scale — a video presentation taken from the @Scale conference, by Google engineer Frances Perry, that explains the Dataflow model using an earlier version of the mobile gaming examples described above. "The World Beyond Batch: Streaming 101 and Streaming 102" — a two-part series of posts on the O'Reilly blog, by Google engineer Tyler Akidau, that examines the future of Big Data processing.